When I woke up on in Pokhara, Nepal, on Tuesday morning, I didn’t know I’d do my first bungee jump in Pokhara a few hours later. But that’s exactly what happened. This was my last week in Pokhara, Nepal. As I wrote in my previous post, my life there was quite… well, I guess stable would be a good definition. I studied Nepali language quite intensively for three weeks and I did not have any big adventures. “Bungee jump!” I hear your mind filling the sentence. But no, I had no intention whatsoever of bungee jumping in Pokhara during this visit. 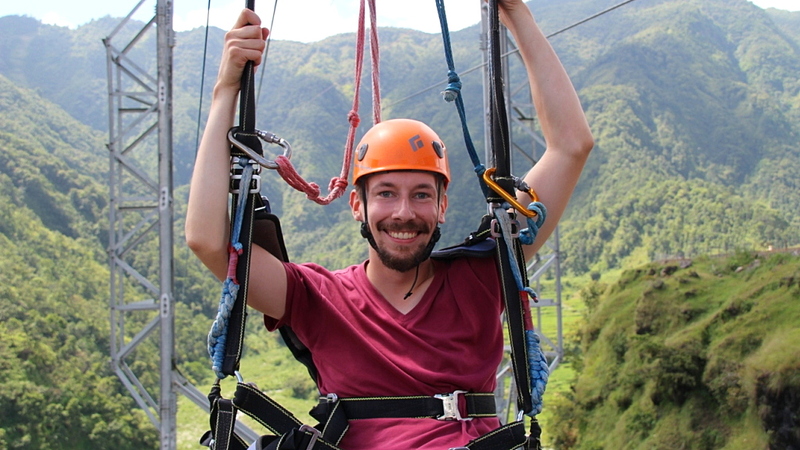 Instead, I thought I’d take a ride in world’s longest Zip-Flyer offered by HighGround Adventures – a company that just happens to arrange bungee jumps near the Zip-Flyer landing site in Pokhara, Nepal. The zipline hangs high up in the air. What is Zip-Flyer, anyway? In a Zip-Flyer, you sit down on a seat that hangs from a thick cable. You start the ride from a high spot and glide along the cable at a high velocity to a lower area. No engine needed, just pure gravity. 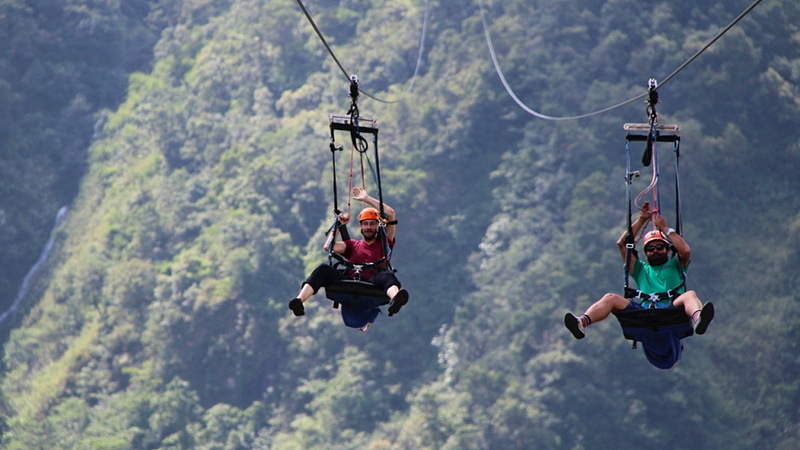 In the case of the Zip-Flyer of Pokhara, Nepla, the zipline is 1800 meters long and has a vertical drop of 600 meters. You start from the top of the 1500 meter Sarangkot hill and glide down at a very high speed to the landing site. According to the HighGround Adventures website, their Zip-Flyer is the longest, steepest and fastest zipline in the whole world. 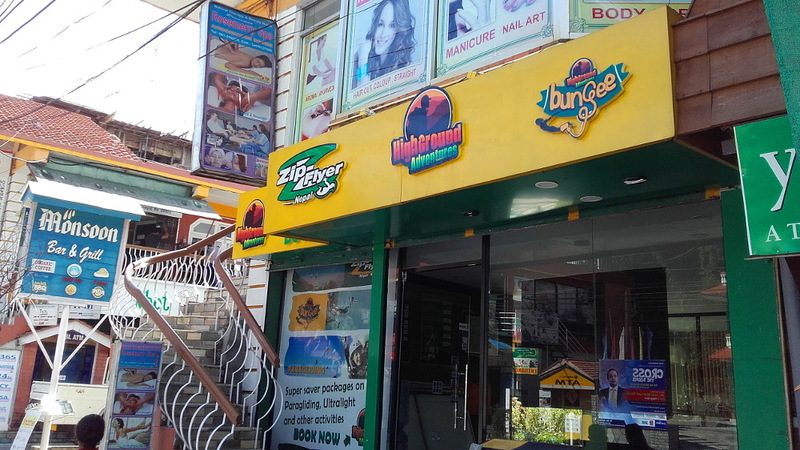 The HighGround Adventures office is located in the northern Lakeside of Pokhara. My departure for the Zip-Flyer was at 11 AM at the HighGround Adventures offices. As I came to the office, I filled the necessary documents and paid the ride. A friendly office worker asked me if I’d like to also do a bungee jump. I thought about it for a few seconds, but said no. I had thought about doing a bungee jump at some point during this trip, but that “some point” referred to a distant future. The idea of doing it on my own seemed too scary. On the previous day, I had talked about bungee jumping with my brother on Skype. I said I’d rather do a tandem parachute jump. As we waited for our departure, I started talking with a Nepalese man called Rabindra who was also waiting at the office. 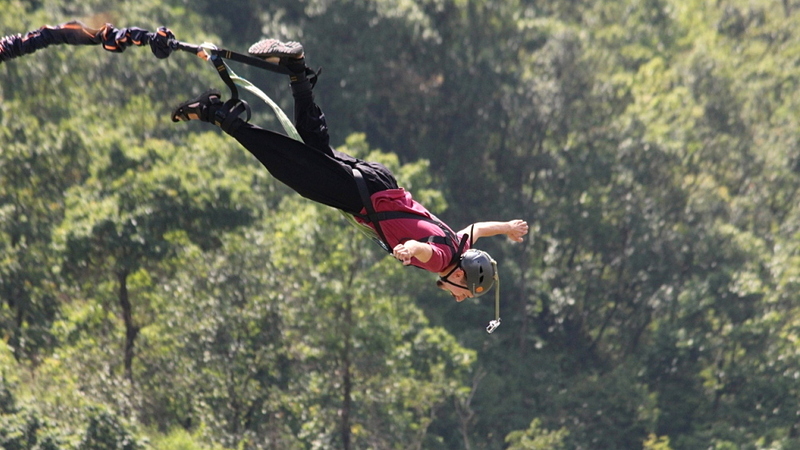 Rabindra was not only doing the Zip-Flyer, but the bungee jump in Pokhara as well. I was glad I wasn’t in his shoes. The thought of doing the Zip-Flyer felt very easy when I compared it to the bungee jump my new friend would soon perform. Gliding down on the zipline with Rabindra. 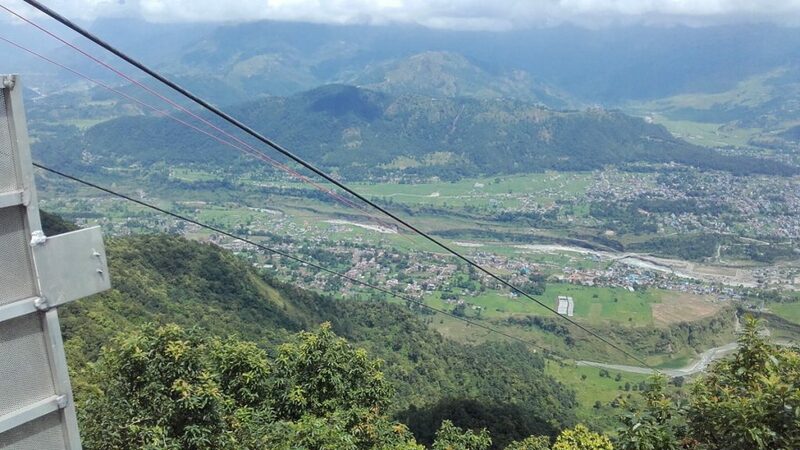 When we arrived at the top of the Sarangkot hill, me and Rabindra got to do the Zip-Flyer at the same time on adjacent cables. We hung in our racks and put our feet on the metal gates that were kept shut until the start. As the gates opened, we started flying down in the sky at extreme speeds. It was a fun, short ride that lasted less than two minutes. The blazing wind on my face made my eyes tear up and the velocity of the ride pumped adrenaline in my body. When the descent was over, I felt thrilled. Feeling happy and carefree after the ZipFlyer. After the Zip-Line, I still had to wait at the landing site. Rabindra and me were sort of paired up of by the company, so I was told to wait for him to do his bungee jump before we’d get a ride back to Pokhara together. 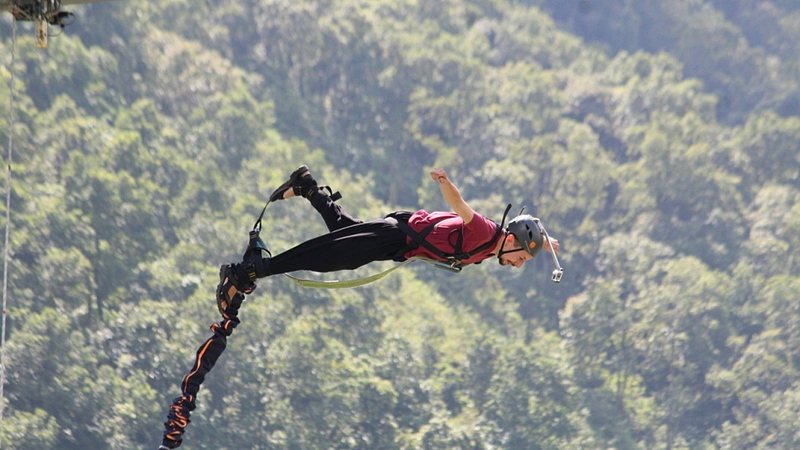 At this point, the idea of a bungee jump didn’t seem impossible anymore. I looked at the bungee tower, which didn’t look very high in comparison to the hill from which we had just come down. The conditions also seemed very good: I had a friend whose jump I could see first and I was already at the location. The dopamine rush of the Zip-Line was still affecting my brain, so I didn’t feel afraid. Then, a Latvian worker of the bungee jump site asked if I’d also like to jump. This was just the push I needed. “Alright, I’ll do it”, I responded. I paid for the jump and I was glad I could still get a discount for doing them both. 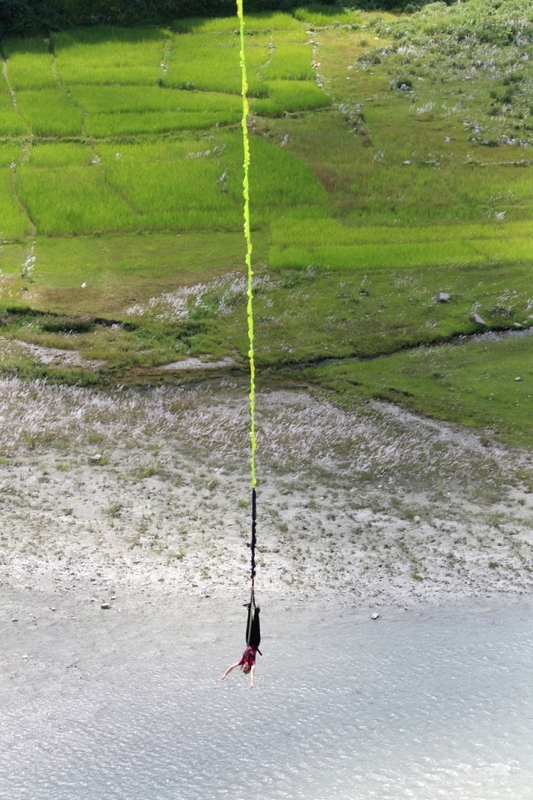 On their own, both the Zip-Line and the bungee jump in Pokhara cost 60 US$ each. When bundled together, the whole package cost 100 US$ plus an extra fee for pictures. It’s not super cheap, but it could be much worse. 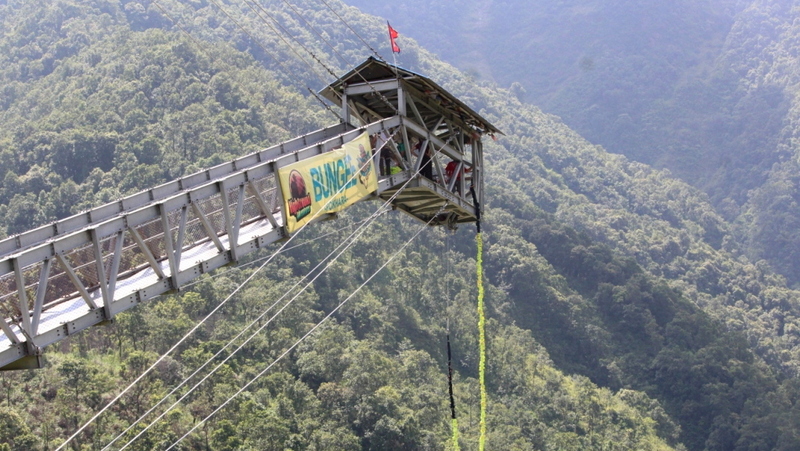 The bungee jump tower in Pokhara rises above a river gorge. When I agreed to do the bungee jump in Pokhrara, I thought I could do it after Rabindra. Well, I couldn’t. Instead, the Latvian worker told me that I had to do it first. He may have said it had something to do with the rope adjustments for different weights, but I’m not sure. I didn’t have much time to be afraid and I felt almost calm when I agreed to jump. But as I climbed up and reached the top of the 70 meter high tower, the fear kicked in. I used to be very afraid of heights when I was a kid and I’ve never learned to jump head first into water, so the idea of dropping face down from 70 meters didn’t seem to intriguing. ”3, 2, 1, go!” the Latvian guy shouted. I detached my hands from the railing and started leaning over the edge. The point of no return. I closed my eyes for a few seconds, as I didn’t dare to look down when I learned forward. After some senseless screaming, the first intelligent word I shouted was “BAFFREBAFF!”, which is Nepali for “oh my god”. The fall feels very fast and very short. You don’t have much control of your falling, you just drop down from the sky at an extreme speed. When you fall, you don’t really get to enjoy the views. The scenery flies by so fast that you can’t really focus on anything. As I felt the rope slowing my fall, the euphoria began. I was still alive and the fear was gone, replaced by extreme joy. I’m usually a very, very, calm person, but I screamed from the top of my lungs to express my excitement as I bounced up and down on the rope like a yoyo. After the fall, my rope started spinning quite rapidly and uncontrollably. At first, I was afraid of getting all queasy from the spinning, but it didn’t happen. When you hang head and hands down as a straight line and whirl around your own axis, the spinning doesn’t feel so bad. Once I stopped screaming, I just closed my eyes, smiled and felt at peace. Afterwards, I watched Rabindra jump. He later told me he was very, very afraid before the jump, but I couldn’t see it from down below. Instead, his jump looked very good, as if he was a professional. We greeted each other down at the landing side and soon headed back to Pokhara. Rabindra plans to do a bungee jump twice as high near Kathmandu later. For me, bungee jumping in Pokhara is enough for now. 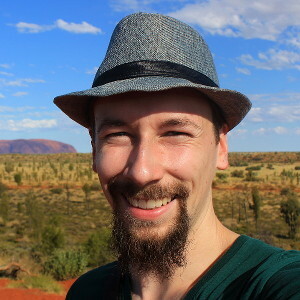 Would I recommend a bungee jump to others? Yes, absolutely. 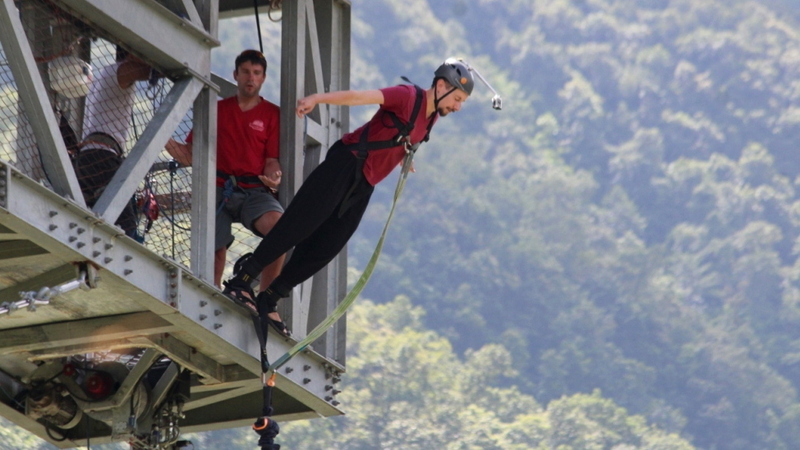 The bungee jump experience is over very quickly but those few seconds might be some of the best seconds in your life. 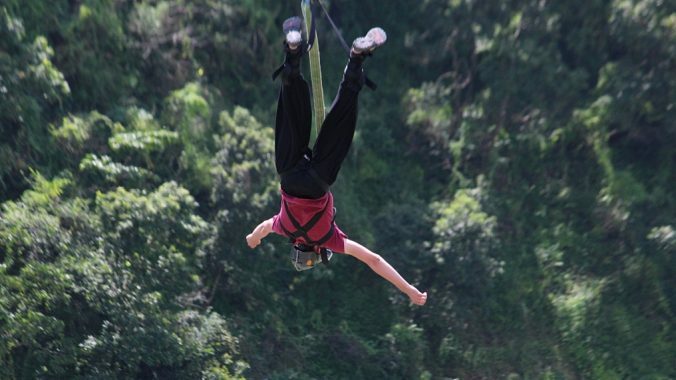 I’m also glad that I started with a 70 meter bungee jump in Pokhara instead of a lower drop. Those 70 (or probably more like 50, as your jump doesn’t end very close to the ground) meters were gone almost too quickly. Now, I wonder where I’ll get a chance to do that tandem parachute jump? When I first came to Pokhara, I went paragliding. Now it was time for something different. Arimo Travels Featured in a GoEuro.com Article!